We're having a bird. Actually a chicken, but it's close. Someone in the house hates turkey, and frankly I'd rather not have a freezer stuffed with a 17 pound carcass worth of meat plus all the soup I'd have to convince myself to make. It's easier anyway to cut the bird up before cooking, then only cook what you want. That way you don't have dried out turkey that nobody wants sitting around for months. Now, mind you, Rack the McNab SuperDog (TM) will not be having any of it. The chicken will be cooked with Onions, and they're toxic to dogs. Chicken makes him sick because he's got a grain allergy. Sorry Pup, you're noing to have to settle for your usual dog food! 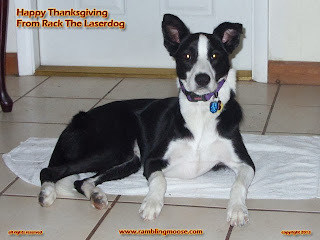 In fact, there really isn't anything that will be on the typical Thanksgiving table that you should feed to your dog. It either has too much fat, sugar, seasoning, or is just downright Toxic. Here is a list of ten foods to avoid feeding your pets. So if you do celebrate the day, do enjoy it. If you don't you can enjoy it however you normally would. But for me, the night before, I'm going back to watching TV in Spanish to practice. See, I've been doing that all day and it's getting easier. Oh, and make sure that you bird has been thawed appropriately. If not, fill the sink and plug it with luke warm water and put it in the water. The water will "draw off" the cold and bring it up to temperature faster - you do not want to use hot water since it will cook it, and even breed bacteria.